The event took place on the corner of Mackay St. and de Maisonneuve Blvd. W. from Sunday, March 15 at 5 p.m. to Friday, March 18 at 5 p.m. It is run by Commerce and Administration Students’ Association students and organized by Concordia alumni Josh Redler. This year, Concordia raised approximately $12,000 out of a stated $15,000 goal. Redler started the campaign at Concordia in 2008 while finishing his marketing degree at the John Molson School of Business. He is also the national co-chair for 5 Days for the Homeless. Those partaking in the event are required to remain on-campus for five days with only a sleeping bag and a pillow. Participants are required to continue attending classes or work, while living off of food donations and sleeping outside. They are also not allowed to use personal communication devices and they can’t shower. Participants who stayed for the whole duration spent 120 hours outdoors. All proceeds will go towards the charities Dans La Rue, which helps youth under 25, and Chez Doris, which provides shelter and services to women. Since 2008, Concordia has raised $300,000 for the two charities. As of 2015, $1,657,650 has been raised nationwide through this initiative. While donating money, clothes and food are necessities; this campaign stresses the importance of empathizing with the homeless. According to a study that surveyed 506 homeless service users in the UK, 61 per cent classified themselves at “lonely,” 37 per cent felt “often” isolated, and 35 per cent report that they lack companionship. “Not being looked at for hours on end has such a psychological impact that you don’t realize can make someone happy,” Redler continued. 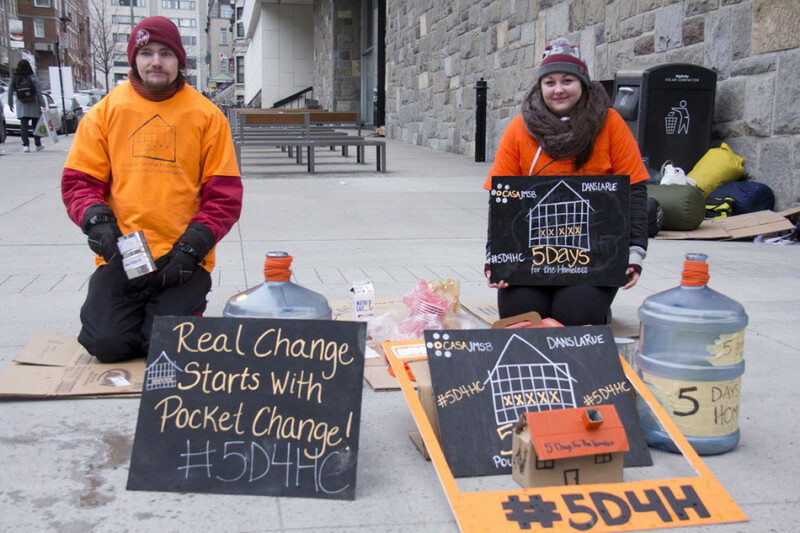 Correction: In a previous iteration of this article, the total amount raised for both Concordia and Mcgill was taken directly from the 5 Days For The Homeless website, however according to organizers those numbers didn’t take all donations into account, and were false. The Concordia donations have been changed to reflect the approximation of the organizers.